Just wanted to pop in and share a little love I found this week. 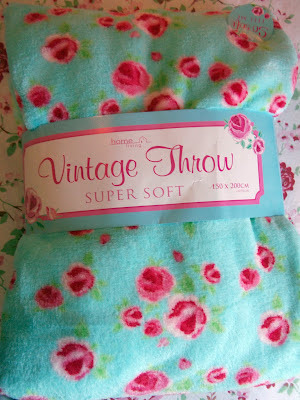 Super soft 'Vintage' style throw - very CK ish. It's soooo very soft and it's my new TV blankie, you know when it's a bit chilly or you are a bit poorly and you just want to curl up on the couch. 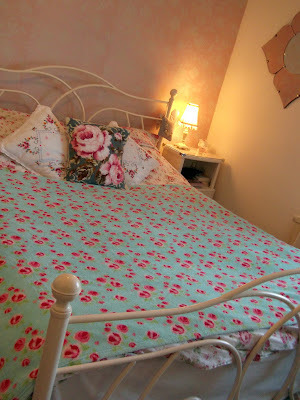 I have shown it here on my bed just to give you an idea of the size of it, my bed is king size and it almost covers it. For £8.99 I was rather pleased with it. There is a stem print one in the same store which is very Orla Kiely - same price. B&M Bargains again, one of the better cheap stores for neat finds. In other news I have been busy with my crochet hook as I finished off all of my squares for the blanket swap last night. 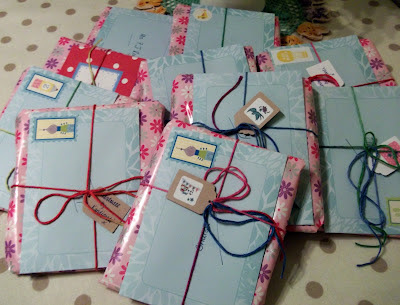 I have posted most of these out this morning and the rest will be on their way on Monday. I really enjoyed making these but kind of glad I've finished now as I have another project that I'm itching to get on with, a Christmas Quilt of all things, in March! 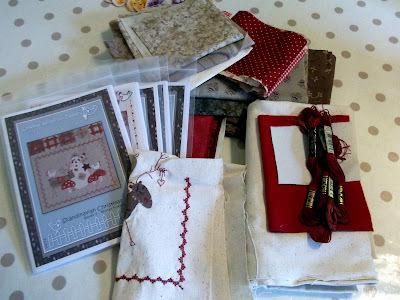 A wonderful Lynette Anderson gift from a good friend and I am itching to make a start on it, I will keep you up to date with my progress on this. I'd leave a comment but I'm just rushing out the door to B&M! ;) that's a gorge blanket - love it. Perfect for picnics! Well done on your squares swap and beautifully wrapped/presented! Funny, I've been making winter /christmas cards...ones that didn't get done for the last season! Looks a lovely blankie. Well done for finishing your crochet squares. I can't wait to see progress reports on your Christmas quilt. nice to hear I'm not the only one that cuddles up with a blanket in the evenings, mines not half as pretty as yours.I've just finished my squares as well. I love your blankie, it looks so soaft and sunggly, I want one!